Welcome to the Vida Flamenca Blog featuring the latest flamenco documentaries and videos from our local, national and international communities. Bienvenidos al Blog 'Vida Flamenca' para la comunidad flamenca, con lo último en documentales y videos flamencos a nivel local, nacional e internacional. 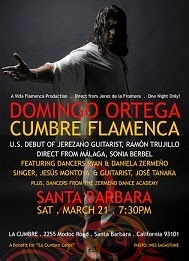 DIRECT FROM JEREZ DE LA FRONTERA, DOMINGO ORTEGA in a rare Santa Barbara performance! This promises to be an unforgettable flamenco show, as Domingo Ortega Domingo Bailaor Ortega is one of the most prominent dancers of his generation. Based in Jerez de la Frontera, one of the cradle cities of flamenco in southern Spain, Domingo Ortega is known for his riveting performances as a soloist and innovative choreography. Also featuring, guitarist Ramón Trujillo direct from Jerez de la Frontera in his U.S. Debut. Ramón has been featured on numerous recordings by important artists such as La Macanita, Potito, Niña Pastori as well as Camarón de la Isla. Santa Barbara favorites Ryan y Daniela Zermeño, and featured dancers from the Zermeno Dance Academy will be performing new choreography for this show. The powerful singing of Jesus Montoya, and guitarist Jose Tanaka bring incredible musicianship to this one night only show. Just added, cantaora Sonia Berbel from Malaga! Copyright © 2011 Beth Nesbitt, Vida Flamenca Blog. Travel theme. Theme images by molotovcoketail. Powered by Blogger.